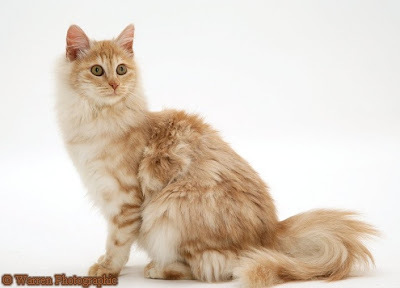 A long-haired feline, the aristocratic Turkish Angora is one of the most ancient cat breeds. It is a natural breed, and has resided for centuries around the city of Ankara in Turkey. It shares similarities with Turkish Van and Persian. As a matter of fact the Turkish Angora was used heavily for the development of the modern Persian. So much so that nearly all purebred cats were lost. Fortunately this beautiful cat was declared a national treasure in its native land and a dedicated breeding program was initiated. Thus the Turkish Angora was preserved and in coming years found its way to other parts of Europe. It gained recognition in United States in nineteen sixties. However, only white colors were accepted initially and it was not until a decade later that all colors except for the pointed variants were included in cat fancies. A lithe and muscular cat, the Turkish Angora is a medium sized breed with an average weight between seven to ten pounds. Body is finely structured with a triangular head, almond shaped blue, green or amber eyes and longish ears. Coat is single in layer, silky in texture and often white in color. Other colors and patterns include black, blue, cream, red, silver, smoke, tabby and tortoiseshell. Like the Van Cat, the Angoras show fondness towards water. They have a graceful air about them and usually establish themselves as the top cat in a multi-pet household. They are healthy and active in general though there are reports of hypertrophic cardiomyopathy and deafness in some lines. Occasionally kittens with a genetic neurological coordination disorder are born that pass away in infancy. Turkish Angoras are very active and playful. They maintain their level of activity as they age. Also known for their intelligence, these felines are attention seekers and vocal. They are not shy and try to bond with strangers as they do with family members. Curious by nature, they follow their humans around everywhere, trying to take part in their activities. They are athletic and are capable of leaping a surprising distance with ease. Despite their assertive personality Turkish Angoras are loving and sweet felines and readily accept other pets in their household. Owing to their liveliness and adaptability, these pretty cats are cherished by an ever increasing number of adoring pet owners around the world. Mine is probably a little mixed, but the gray forehead spot (which faded as he grew), the fluff, the ears and their hairs, the features, the comparably late maturity, and the "I think I sprang from your womb" / possessive mentality are all marks of my dear 6YO Calvin. What you wrote describes my Beau perfectly. He has never met a stranger, and flaps everyone with his big plumetail. Pure white and deaf, he is beautiful and full of energy and a really sweetheart of a cat. My cat proda fits the describsion of a turkish angora.She is white and is soft med. long haired,with taby spots and a fluffy tail that looks like a racoon tail.Wish I knew for sure.Any thing else I should look for? hi im amy and i have a turkish angora and i was wondering till wat age do these cats live up to ?? A yr ½ ago we found this beautiful white, blue-eyed cat, aprox 9 mths old, at the car lot where I work. She was a bit dirty and seemed had lost her way back. She settled at the lot for 2 days, while we were feeding her and on the 3rd day we took her home. The poor thing slept almost continuously for about 3 days... 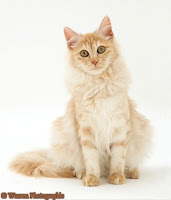 I researched over the internet and I'm almost positive she is a turkish angora. We also learned that she is deaf, so we do not let her out of the house. I carry her out everyday so she can make contact with nature for a while. I'm a cat lover, I also have 5 other cats and recently we found a 2 month old gray cat(now 7mths) that looks like a nebelung cat. Med size gray/silvery hair. Just adorable. I just had to write me story. Oh! I also have 3 dogs. Is there a way we can post pictures on this site? That's a wonderful story. Thank you for taking good care of the Angora, and all your other cats, and providing them with a good home. You are most welcome to send your pictures at support@ofcats.com and I will try to include them in this website. Cool cat. I like animals very much. Thanks for interesting post. It's a very beautiful cat but it's very difficult to take care about it! I recently rescued a TA, All white with blue eyes. He is a great cat. Friendly, strong, playful, affectionate. I have turkish angora too. They are wonderful cats. About a year ago I rescued five kittens from a neighbor who was intent on killing them and reunited them with their feral domestic shorthair mother. I kept them in a huge cage in my bedroom until they were weaned then took the mother to a vet and had her spayed. Four of the kittens fit the discription of the turkish angora (two white, one gray, and one black.) The fifth cat was a red domestic shorthair. Fortunately, I was able to adopt four of them out and I kept the gray female (Madeline) who is a real treasure. I heard from that cat 101 show on animal planet that they live up To 20years. 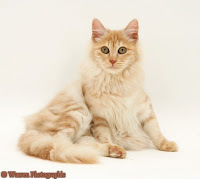 I was given a tiger striped Turkish Angora and have been looking for info about them. I have never seen a black and gray striped Angora before. If any one can give me info, it would be appreciated. We got a white Turkish Angora with odd eyes (one green, one blue) from Battersea Dogs & Cats Home. She was handed in as a "stray" but due to her behaviour, we feel that she was dumped by a breeder because she was deaf. She's been part of our home for 11 years now and is definitely the boss. When she's got her nose in the cupboards or is happily scratching the furniture, we still shout at her despite her deafness. She doesn't care and carries in as normal. Her biggest fault is attention seeking. If she feels that she's not being adored, beware of anything on the table. She will swipe things onto the floor until our reaction is the one that she desires. She has us well trained. We wouldn't swap her for anything. Priority circle loyalty program: this kind of aspect allows some QuickBooks most valuable customers’ access to loyal customer success manager. QuickBooks Customer Service Number It can help you by giving labor in crucial situations to reach your ultimate goal. They make sure that you have the right products to own a beneficial outcome.